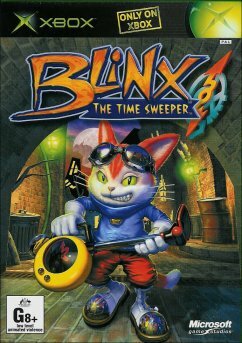 Quite possibly the most innovative game to yet grace the XBox console, Blinx the Time Sweeper is the first game to fully utilise a vital piece of XBox equipment: The hard drive. Recording every single moment of the game onto the hard drive is no small feat considering that gameplay doesn't stutter or falter as a result of all this activity. Incredibly every single move you make for each 10 minute time sweep is replayed at the end of each level which is pretty impressive in itself but bearing in mind that Blinx can actually alter and distort time, then it's another ball game altogether. Blinx is part of an organisation that monitors and protects the orderly flow of time. 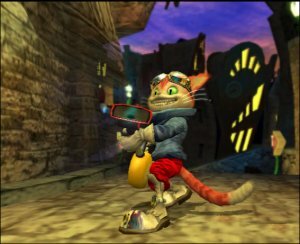 Quite like in Back to the Future, if there is a problem then Blinx or one of his Time Sweeper buddies go to that place and take out the Time Monsters created by the rift and restore order. Their tools of the trade are called time sweepers but to you and me they just appear to be extravagant vacuums. The beauty of these is that not only are they used for day to day work restoring time, they can also be used as offensive weapons. Each 'sweeper can carry up to 5 items and it's important that you know what you carried last as you actually go around the level sucking up items that you can use as missiles throughout the game. The size of the object vacuumed determines it's damage level to the monster you are fighting. For example, if you are about to fight a huge monster then you should make sure that the last item you sucked up is very large as that lampshade ain't gonna do anything! The last item you vacuumed is that first item the timesweeper will shoot. You have been warned! In order to manipulate time, you must collect the time crystals that are scattered around and about each and every level. Collecting the crystals in a certain order will reward you with a time power that can be activated by holding down the B button. The cool thing about this is that all action onscreen stops and a control similar to that of a video recorder appears that lets you activate a time control. Use and conserve time controls wisely as when the game progresses you will need them more than ever. The first few levels certainly ease you into using the controls and getting used to the overall control system, but the game does certainly up the ante as you go further in. The game is linear in it's progression meaning that you can't skip to one level without finishing the one before it. It makes sense in this case and also helps you prepare for the challenging boss level at the end of each lot of 3 levels. 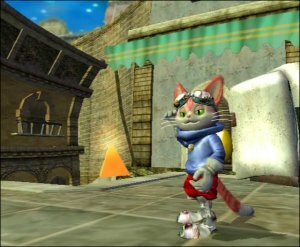 It is imperative however that you do go backwards and redo levels at times in order to find more gold and secrets to purchase upgrades for both Blinx and the Time Sweeper itself. Graphically, Blinx is absolute pure eye candy. Multiple effects have been used to great purpose and the use of lighting and particle effects look fantastic. Real time shadows give credence and realism to the movements of the ingame characters. Animations are superb and do the creatures justice. Monsters are created from left over time crystals are have different attributes and appearances. Attacks to Blinx will vary and if he gets hit even once then you better hope that you have some replays up your sleeve which can be found scattered around levels in the form of hearts. Once hit, if you have a replay, the game will 'rewind' back 10 seconds allowing you to avoid the mistake that caused Blinx' death. It's amazing to witness and a real innovation as far as gameplay ideas go. You can only store up a limited number of time controls throughout the game and this will increase in time. The effects used when activating one are nothing short of spectacular. 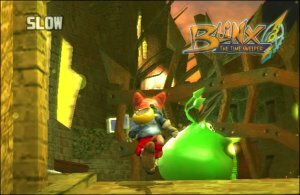 Pausing will freeze play throughout the game except for the movement of Blinx himself, allowing you to attack or dodge things at your leisure. There is a countdown letting players know that the time control is about to run out so to get done whatever you have started. Apart from all the monsters, you also have to contend with members of the Tom Tom Gang who are intent on stealing the time crystals for their own needs. Blinx has to take these bad guys out as well by aiming his Time Sweeper and shooting items that have been previously sucked up. I found that there were some issues with aiming the 'sweeper and often I would miss what I was going for. Not enough to fully diminish gameplay but enough to be occasionally annoying. Also Blinx himself doesn't move that quickly when it comes down to gameplay. That is not to say that there are animation issues as there are not, the cat just doesn't seem to want to go beyond a loping trot and when there is a time limit it does get rather teeth gnashing at times. I wondered why as I was playing this game that I didn't feel myself connecting with the main character as I am a sucker for platforming type titles and others of that genre on PS2 and GameCube have had my attention for hours on end, desperately trying to complete the next level. Blinx has the looks and attributes to be a mascot type figure for the XBox however I think that for the most part, he won't reach the stature of Mario or Crash Bandicoot for one very simple reason. He doesn't have a storyline ongoing in the game giving him a soul of sorts that endears to the player. There was not much in the way if anything of storyline progression upon completing levels other than the new level becoming accessible. Even failing to complete a level only gave you a 'game over' screen, whereas in other platformers such as Jak & Daxter (PS2), Daxter would look over your fallen body with some smart comment. I think that maybe Artoon spent more time making sure that the techno side of the game was immaculate, and apart from some dodgy camera angles it is, and not enough time developing a fleshed out character with storyline to appeal to gamers. The fact that he didn't even speak English went against him as well. Maybe they will take heed of this in Blinx 2, which I certainly hope is on the cards. Deliver a fully fleshed out character that will knock our socks off with story and character development and Blinx will be a worthy mascot for the XBox. Until that time however, it looks as though we'll just have to give the Master Chief from Halo fur! Blinx is revolutionary in it's design and for collectors is an important title to have in your collection, pretty much the same way that Metal Gear Solid 1 & 2 were, and actually for somewhat similar technical reasons. Metal Gear Solid used the memory card to distract the player later in the game by making reference to choices made throughout the game. Blinx is the first XBox game to actively use the hard drive as a source of entertainment generation as opposed to a convenient oversized memory card. Add Blinx to your collection today for some innovative and fun filled gameplay! Recommended!